It's April Fools' Day and everyone is looking for the best pranks to follow their friends, family and colleagues. The day has various stories and theories of origin attached to it. And over the years, brands have also joined the bandwagon of pranksters. In recent years, brands known for their social media presence reveal or launch something new, quite different from their league. While many users may fall for it, the brand looks at engaging their fan base. This year everyone from app-based taxi service, Ola to beer brand Kingfisher has taken to social media trying to fool their followers. While some seem to have fallen for their fake products, others have realised it's the brand's age-old technique. And some of them are quite believable which will leave you thinking if at all they are real. April Fools' Day 2019 Messages & Images: Prank Quotes, Funny WhatsApp Stickers, GIFs, Photos, SMS, Greetings to Wish Happy April Fool's Day to Your Friends on 1st April. 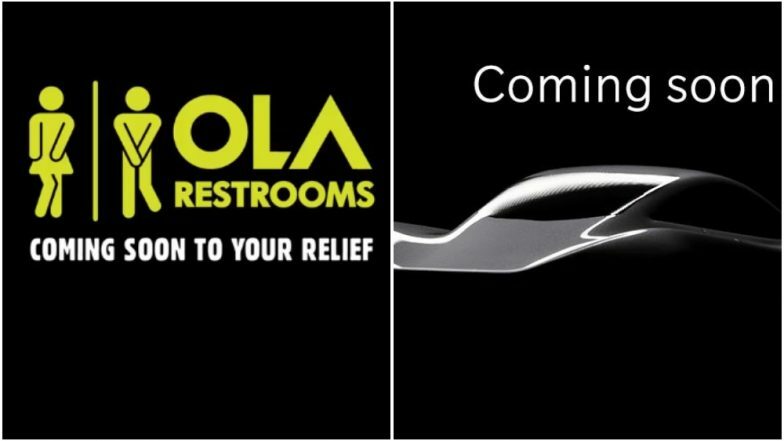 According to Ola's tweet, they are soon going to start washrooms under the name Ola Restrooms. These will be cabs converted into washrooms for those on the go. While the video tries to be convincing, we can't also deny the fact that Ola comes up with a prank every April Fools' Day. They tweeted the video saying, "Introducing Ola Restrooms. A place to go, for a generation that’s on the go. #OlaRestrooms #NoPressure." Google April Fools' Day Jokes: Year Wise List of All New Fake Features Introduced by Google as April 1 Pranks. Mc Donald's India tweeted on Saturday introducing 'Glow in the Dark Burger' that clearly looks like an April Fools' Day prank. The photo shows a dark green-coloured burger with dark pink patties glowing in the dark. The fast-food chain tweeted saying, "Hey night owls, eating in the dark won't be a problem anymore! #ComingSoon #Maybe." Kingfisher joined pranksters bandwagon by tweeting that they have launched instant beer powder. The company's co-owner Vijay Mallya tweeted saying, "Introducing Kingfisher Radler! Refreshing, Non-Alcoholic Drink!" Explaining the new concept, their YouTube channel says, "As the leading Beer brand of the country, Kingfisher feels that it is our responsibility to ensure that your beer drinking experience is hassle-free. Presenting the all-new Kingfisher Instant Beer. Just add to chilled water, stir and enjoy the good times anytime, anywhere." Lays joined the group of brands trying to fool people last year with two pranks. One said they have launched Pepsi flavoured Lays, another one said that you need fingerprint technology to open a packet of Lays. The second is intended at saving your packet of chips from being stolen. Both amused users with some falling for the pranks. April Fools’ Day 2019: Bizarre Yet Funny Facts and Messages About April 1st to Send on WhatsApp to Blow Your Friends’ Mind! China-based smartphone maker OnePlus tweeted the picture of an electric car saying 'Coming soon'. OnePlus co-founder Carl Pei revealed photo the picture with a teaser image and blog post. The teaser comes with a hidden message which reads 'Yes, we do cars now'. Google has temporarily added a version of the classic game Snakes into its Google Maps app for April Fools' Day 2019. The company says it is rolling out the new feature for its iOS and Android users globally today. They have also launched a site for those who want to play the game, in case you don't have the app. You can check it on the homepage where it is written: "Google Maps has changed the game". According to one of the theories stating the origin of April Fools' Day, it began in 1582. It says that it began when France switched from the Julian calendar to the Gregorian one and some people refused to follow it. They continued to observe April 1st as the beginning of a New Year. Hence, to force January 1 as New Year's first date on people, those who observed April 1 as New Year were called fools. Eventually, April 1 came to be known as fools' day with people trying to play pranks on others. Meanwhile, we hope you don't get terribly pranked this April Fools' Day!